At Ball, we have been researching effective ways to promote sustainable gardening for several years. Part of that process included the creation of our CIRCLE OF LIFE Garden at our company's headquarters in West Chicago, Illinois. We encourage home gardeners to continue the sustainable practices that CIRCLE OF LIFE growers have begun with their plants, and the CIRCLE OF LIFE Garden gives us the opportunity to evaluate the effects these practices have on plants. The CIRCLE OF LIFE Garden has been chemical-free for three years. We use environmentally-friendly practices like double-digging and applying compost teas and organically-based fertilizers. Our garden, planted in the form of six circular beds, has shown that CIRCLE OF LIFE plants develop better roots, establish faster when planted and are generally more tolerant to climatic stresses, insects and diseases. 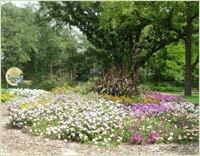 The CIRCLE OF LIFE Garden is a demonstration that sustainable gardening can be easy and beautiful. We believe that, given a choice and the right tools and information, many gardeners will choose to garden in this way. CIRCLE OF LIFE plants provide the perfect start to an eco-friendly garden. 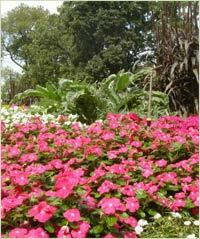 Home gardeners can expect excellent quality and terrific performance from varieties in the CIRCLE OF LIFE program. What does it mean to be sustainable? Plants thrive in the favorable environment created by CIRCLE OF LIFE growing methods. A healthy plant is naturally more tolerant to stress from temperature, diseases or pests.